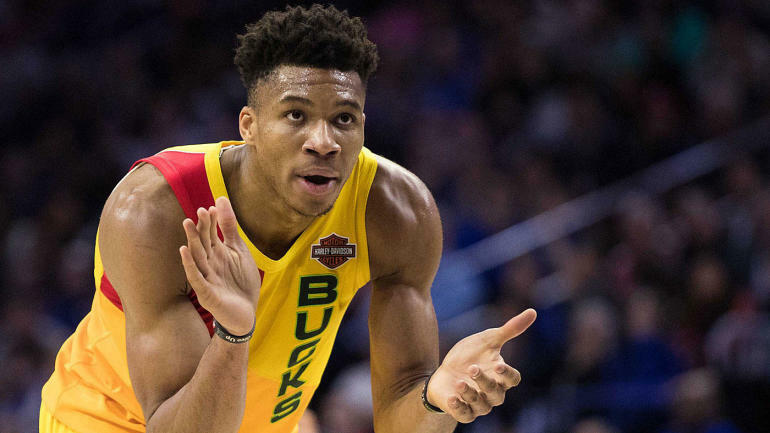 The Milwaukee Bucks will look to continue their season-long dominance over the Detroit Pistons when they meet Sunday in the opening round of the 2019 NBA Playoffs. The Bucks (60-22) are the No. 1 overall seed and have won seven of their last 10, while the Pistons (41-41) are the No. 8 seed after winning two in a row. Detroit, however, is 4-6 over the past 10 games. Tip-off is scheduled for 7 p.m. ET from Fiserv Forum in Milwaukee. The Bucks, who won all four regular-season meetings with the Pistons this season, are 9-2 in the last 11 meetings with Detroit. The Bucks are 13-point favorites in the latest Pistons vs. Bucks odds, up from an open of 11.5, while the over-under, or total number of points Vegas believes will be scored, opened at 219.5, but has dropped a point. You’ll want to see what the SportsLine Projection Model is saying about the game before making any Pistons vs. Bucks picks. This model, which simulates every game 10,000 times, is crushing its NBA picks. It entered Week 26 of the 2018-19 NBA season with a sterling 292-234 record on all top-rated picks, returning over $4,000 in profit to anybody following them. And it has been particularly red-hot on its A-rated NBA picks against the spread, entering Week 26 on a strong 76-59 run. Anybody who has followed it is way up. Now the model has dialed in on Pistons vs. Bucks. We can tell you it’s leaning over, but it’s also generated a strong against the spread pick that hits in nearly 60 percent of simulations. That one is available exclusively at SportsLine. The model knows the Bucks will look to extend Detroit’s road woes in the series. The Pistons finished the regular season just 15-26 away from home, while Milwaukee posted the best home mark in the league, going 33-8. The Bucks were also in the top five in several statistical categories, including first in rebounding (49.7), scoring (118.1) and point differential (plus-8.8), and third in points in the paint (4,374) and field goal percentage (.476). Forward Giannis Antetokounmpo continues to be a force, averaging 34.3 points over the last four games he’s played, and scored 32 points against these same Pistons on Dec. 17. Guard-forward Khris Middleton is averaging 25.4 points over the last five games, including 39 against the Los Angeles Clippers on March 28. Milwaukee is 23-16-2 against the spread at home and covered three of the four meetings this season. But just because Milwaukee had Detroit’s number during the regular season doesn’t guarantee it will cover the Bucks vs. Pistons spread on Sunday in the NBA Playoffs 2019. That’s because Detroit has never lost a playoff series against the Bucks before. In fact, the Pistons are 14-3 all-time versus Milwaukee in playoff games. Forward-center Blake Griffin has scored at least 20 points in six of his last nine games. He’s also had a pair of impressive games at Milwaukee this season, scoring 29 points Jan. 1 and 31 on Dec. 5. He is the first Pistons player to post season averages of 24 points, seven rebounds and five assists. The Pistons ranked seventh in defense at 107.3 points per game and are 9-1 when shooting 50 percent or better. Plus, Detroit held Antetokounmpo to under his season scoring average in three of the four meetings this year. So who wins Pistons vs. Bucks? And which side of the spread can you bank on in nearly 60 percent of simulations? Visit SportsLine now to see which side of the Pistons vs. Bucks spread to jump on, all from the advanced model that is up more than $4,000 on its NBA picks this season, and find out.